The debate between Gold and Cryptos for us is of little long term effect. Gold is money, but not currency technically. Bitcoin is a currency, but not money. Both share some qualities, but neither can achieve proper pricing on their own. Gold is restricted by government law for currency use and by delays in clearing. Bitcoin is a great medium of transfer, thus it has currency qualities. But it is not used as money itself, just a transfer medium. The debate is relevant for sure, but one is not a substitute for the other. They share some qualities. They also complement each other in different ways. In the end, it will be down to who you trust to get you your Gold. There is talk of several products combining Gold and Blockchain tech. BitGold is one of them and at least partly owned by Peter Schiff. BullionCoin is another. We also know of products in the works by other major dealers seeking to lock in clients. What intrigues us about one particular Gold backed Crypto is its market structure. BullionCoin is an association of dealers who compete against each other. Not one brand. Thus we feel it is more like an exchange model and will give better pricing from what we see so far. The point is, if everyone has the same tech, content will be king. And content in Gold is competitive pricing and trust. Blockchain removes the need for human custodial trust if properly implemented. Multiple players pricing on a platform creates better pricing. In time, false contrasts will be realized and the true nature of Gold in combination with Crypto tech are revealed. The question is which product will implement Blockchain tech effectively ( we do not know that yet), and ensure better pricing. Gold is money, Blockchain is a pipeline. Bullioncoin.com is an example we are watching closely. The mere mention of the word "cryptocurrency" instills fear, sceptisim and blank looks from most people- none more so than traditional gold and silver investors. Whilst crypto currency values have sky rocketed the downside is that they are extremely volatile. They can rise or fall in value dramatically daily (30-40% is not uncommon) depending upon public/investor perception........and that can change very quickly. The official definition is that it is a digital or virtual currency that uses cryptography for security. Cryptography makes the counter fitting of the currency extremely difficult. Arguably it's main feature and one that should interest ALL GOLD and SILVER investors is that it's organic nature means that it is not issued by any central authority (i.e. Bank) rendering it theoretically immune to government intervention or manipulation. Transactions are also anonymous....something many precious metals holders value. A new crytpo currency is about be launched. Others will come. We will review them all. For now here are some notes from the BullionCoin site. One that is backed by physical gold/silver. A "Bretton Woods" type physical metal standard that will provide intrinsic value; a YIELD (NOT USUALLY ASSOCIATED WITH Precious Metals) ; the ability to take delivery and finally, price stability for each Bullion Coin issued under the system. The downside of most crypto currencies is that they are usually not backed by anything. However, harnessing the Crypto pipeline with Gold on the front end ensures your physical Gold is there and available for delivery. it also ensures the bullion dealer does not get floated on payment, right? There is a demo of the new platform here. We intend to post a review after done with our own tests and speaking with the operators. in the meantime, enjoy the 'debate'. 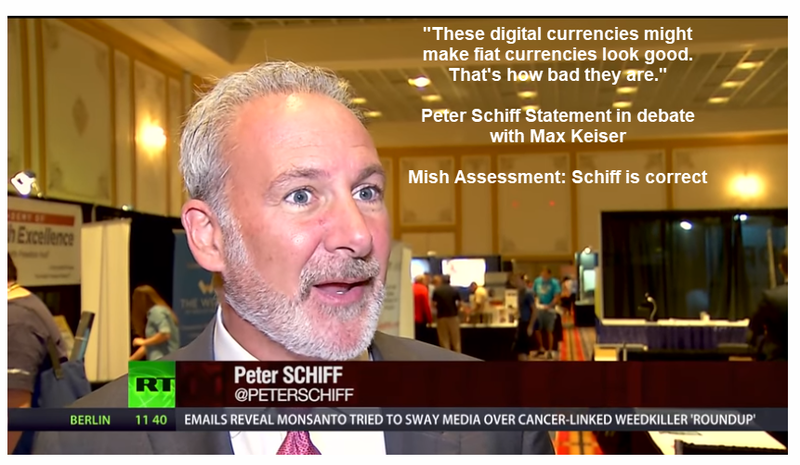 Bitcoin vs Gold: Peter Schiff vs Max Keiser – Who is Right? Bitcoins the New Beaver Pelts? The video was well produced, thanks to Stacy Hebert. It’s well worth a play in entirety. Bitcoins are the new beaver pelts of monetary transactions. For thousands of years, when available by free choice, gold has always been the currency of demand. Things like salt, cigarettes, beaver pelts, and recently Bitcoin, come and go. The scarcity of gold is real. The scarcity of Bitcoin is artificial. It depends on trust that a human-based promise to mine more coins will be limited. In a currency crisis, liquidity crunch, or stock market collapse, where would you rather be? If you choose Bitcoin over gold, you are not thinking clearly. You are dreaming. Blockchain does not scale. Imagine the entire history of every transaction of any size, any place in the world, recorded on a distributed network. Despite the hype, no one would use Bitcoin to buy a candy bar. or even a meal at McDonald’s. One might easily do that with Bitgold. Transaction costs are the difference. Absurd proclamations and theories about the value of Bitcoin are now commonplace. This is typical of any bubble. According to the bank, last year Bitcoin was accepted at five of the top 500 online merchants. Today, only three of the top 500 merchants accept bitcoin as a form of payment. 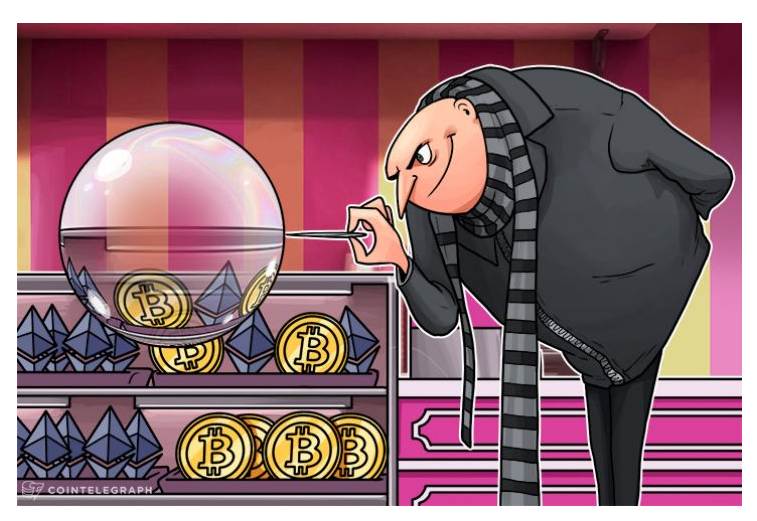 “The disparity between virtually no merchant acceptance and Bitcoin’s rapid appreciation is striking,” the analysts wrote. In contrast, Bitgold is accepted at any place that accepts a debit card. On June 8, I commented Jim Cramer Goes Batty “Bitcoin May Hit $1,000,000”: Act Now Before It’s Too Late! Cramer’s rationale was rather amusing. “When you get hit and you’re not sure how to do bitcoin, these cyberattackers have customer service desks,” Cramer said. Frantically “Trying” to Buy Bitcoins?! The idea that banks need to “try” to buy Bitcoins is absurd. The author’s rationale is based on his own observations of a theory proposed by George Soros. This reminds me of the dot-com “Gorilla Game” theory that stated “gorillas” like Cisco (CSCO) could never be overpriced. No price was too high for a “gorilla”. It also reminds me of absurd click rate measures used to justify stocks whose value eventually went to zero. Schiff went a bit off track at times in the debate, primarily in regards to US dollar bashing. The Eurozone banking system is insolvent. Both the Euro and the Yen are worse currencies than the dollar. Schiff has to know that, but he just cannot stop dollar bashing. While it’s possible the dollar breaks the previous low, at least Schiff was not preaching hyperinflation. That said, I believe Shiff has the dollar direction right for now. I don’t hold grudges or let past differences sway my current take. This puts me in agreement or at least near agreement with the key points made by Schiff in his interview with Max Keiser. Both Schiff and I have an economic interest in Bitgold. I expect his interest is many times the magnitude of my ongoing advertising relationship.